Circle Space Services - Restorative Justice Circles create connections, effortlessly. Restorative Justice Circles create connections, effortlessly. The feeling at the end of the Circle was explained as having a sense of “did I meet you before”? I loved that, and I got it right away. When you meet someone and realize you have shared values, common perspectives and a sense of safety, you feel a bond, a kinship. Someone I think a lot of, and we think alike, offered “maybe we were Sisters, in a past life”. I like that explanation as well, it really sums up that maybe our connection is something bigger and beyond the reality we can see, hear and feel right now. I have to carefully navigate confidentiality here. Something is in the news lately, and a few years ago, someone in Circle talked about being impacted by that situation. Everyt ime I hear the news, I think back to this person, because of the shared Circle experience. I feel more connected to the situation because I heard it from someone directly. When you see eye ball to eye ball, and you hear right from someone’s mouth, you connect to it, because you witness it. I believe Circles impact us biologically. Our brains fire off good chemicals, we relax, our breathing slows down because we feel safe. Our compassion and caring DNA gets to activate, depending on how much nurturing we had as a child. The activity of connection, sharing and growing together leaves us different from when we start the process. The creation of connections are effortless with Circle. As a keeper of the process, lay the foundation, set the table, be in tune to the overall philosophy and hold it closely. I planned an agenda, prepared a powerpoint and had a day-long training session ready to go. 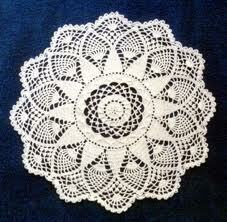 A comment about my Circle center “mat” which is a crocheted doily, just came of out. I shared how a neighborhood Circle used a similar item, and someone in the Circle shared that if just one yarn breaks the whole piece will come unraveled. Our communities should be the same and if we lose just one child, our community is unraveling. I explained that a placemat for the talking pieces also creates something that shows the reverence for them, demonstrating they are special items. I went on to add how a Circle Center reminds us to stay centered. It wasn’t part of the agenda, the only part I had really planned was to do a Circle with the group. In setting up the Circle I told a story, and stories help us connect to each other. It was a brief offered opportunity, I didn’t get long winded (well from my perspective anyway), I stuck to the relevant and important facts. That’s the effortless part. When you can learn to speak, as if you are in Circle – picking the wise-est words, speaking from the heart, with positive intentions for others, how can people not connect. Practice Restorative Justice principles and the connections to each other will be effortless. Effortlessly building connections means people can learn more from each other and open themselves up to the places that need healing. Someone you never met, can suddenly feel like someone you know.